July 9 --- Officially decided to adopt from China through Small World Adoption Agency. Began our application! July 21 --- Accepted by SWA to adopt from China! July 28 -- Orientation meeting at Lisa's house (she lives in Durham even though she works for SWA in TN!) Walked through the China program, any questions we had, and FaceTimed Jodi from CAS to talk about our home study as well! September 21 --- We're approved to start our home study interviews! After seven weeks of gathering paperwork, completing training, being finger printed, have physicals, criminal checks, etc. we've finally submitted everything (except our final mortgage statement since we don't have it and of course moving and our home study fell within the same few months!). Jodi (our wonderful case manager) has now let us know that Tracy (our social worker) will be starting our interviews soon! I am so thankful to have this part behind us and can't wait to get our interviews done. October 29th --- We held an adoption yardsale! We had so many friends come to help us and so many people donate items. We were able to make over $2,000! It was a great time to have an initial fundraiser because it helped us cover some of the initial costs (home study and document gathering). January 4th --- We finally received our certified home study in the mail! Apparently it was mailed to us from Matthews, NC on December 22nd but got sent to our old address. We finally called (wish we had sooner) and they overnighted a new packet to us. We received our original packet a few days later. January 4th --- We mailed off our I-800A. This is the first step in our dossier as it takes the longest to be processes and returned to us. 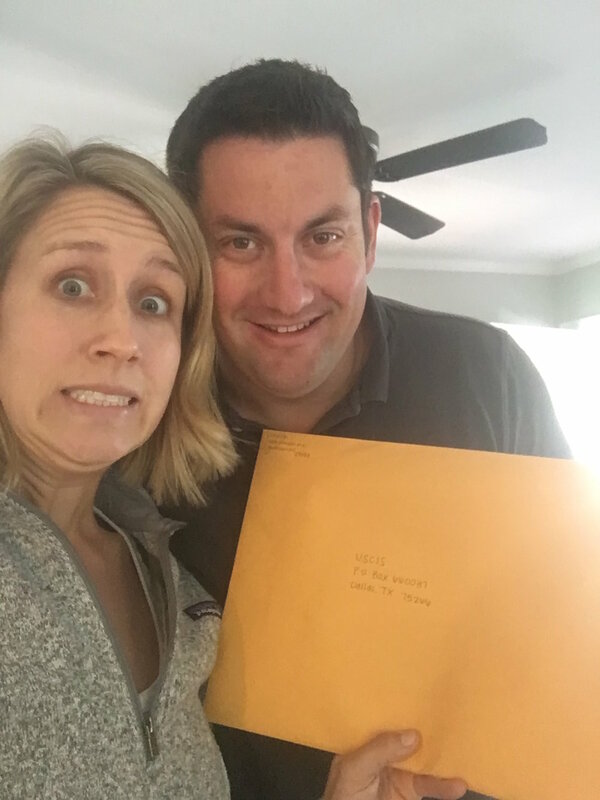 Everything was filled out waiting for us to receive our certified home study in the mail! March 17th --- DTC! Our dossier has been sent to China!!! We are one step closer to having our fourth son or daughter home. It feels surreal and exhilarating and makes my arms ache to hold our little one all at the same time! March 27th --- We're LID! This is our Log In Date for our dossier which means we are now in the system in China and are eligible to be matched with a babe! We are beside ourselves! Someone asked me, "so now what's the next step" and I got to respond and say "getting an email with a picture of our babe". Can't believe it. Butttt, the downside is that this part of the process was running about 1-3 months when we started back in July but it is now running about 4-6 months. A pretty huge bummer but we are trusting that God already knows the babe who will be joining our family and all of these timeline changes are His sovereign plan to match us up with our baby. October 5th --- We received a REFERRAL!!! The file of a little girl, 11 months old! October 12th --- We've filed our Letter of Intent (LOI)! This means we've accepted the referral we've received and are moving forward with accepting her as our DAUGHTER! I hadn't looked at her picture until we decided to accept her file. We prayed and talked and spoke with physicians. Ultimately there was an inexplicable peace about accepting her as our little girl. We typed out the email to send our acceptance and just before clicking sent, Jordan prayed the sweetest prayer over her life, this process, and ultimately that the Lord's will would be done. Truly this was one of the best nights of my life. I cried and laughed and prayed and squealed. I was hysterical. Looking at her video brought out every single emotion I have. October 13th --- We received our Pre-Approval! This means that China will move forward with working to approve her as our daughter! We've been back and forth on names and still haven't decided on a middle name but her first name is...Scout! October __ (can't share yet!) --- SCOUT's FIRST BIRTHDAY! We are so, so excited that we got matched just before her first birthday. We'd obviously much rather be holding her on the night of her birthday BUT we are thankful that we got to celebrate her from afar! We spent her birthday filling out the next step of our paperwork (I-800) to get her home, buying her a few outfits (girl clothes, whaaat?! I don't know what to do with myself! 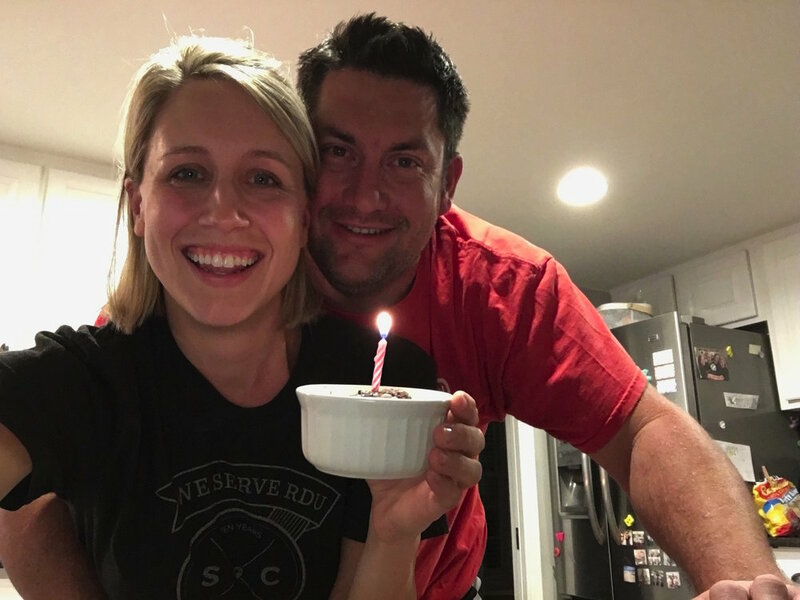 ), sang her happy birthday and blew out her candle, and prayed over her life. October 16th --- We received our digital Letter of Acceptance (LOA). This meant that our LOA was complete and was on it's way from China to our agency. I got so excited when I saw LOA in our inbox only to realize we'd have to wait for it to actually be received by our agency before we could do anything with it! For some reason this felt especially hard. The emotional ups and downs of the last two weeks were extremely high and extremely low. I think the excitement that our LOA arrived only to realize we still had to wait at least four to seven more days was the proverbial straw that broke the camel's back. There were some tears shed this day but thankfully we didn't have to wait through a weekend to hear back! October 20th --- We got our LOA! 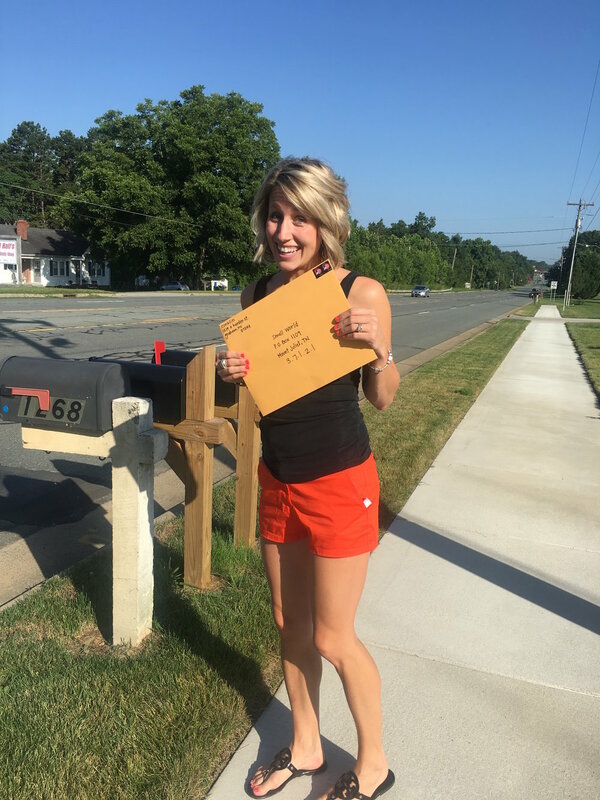 And we mailed off our I-800! It was sitting by the door waiting to be mailed as soon as we received the LOA. We signed it and had it to the Post Office within an hour! This paperwork is so, so specific so I was so nervous about mailing this off! October 25th --- We announced Scout to our family! October 30th --- We mailed off our visas today! This felt like another scary step to keep everything moving along. Everything on this form, just like all the rest, had to be perfect. So we reviewed it like a thousand times, packed up the kiddos and all the paperwork and went to this hole-in-the-wall shipping place in Durham a friend recommended to us. She had just gotten her stuff done there after trying a couple other places so we took her advice and went to get it done at the same place. November 9th --- Received our visas back today! November 13th --- I-800 was approved! November 20th --- NVC letter received. We filled out our DS-260 immediately and forwarded it and the NVC letter to our agency! They filed for Article 5 the same day! We're hoping it will be back December 7th!